What’s all the buz about this LV1 Mixing System? Waves has introduced the new paradigm in Digital Mixing. We have said for years that the next REAL innovation for digital mixing is the elimination of proprietary hardware via software based Digital Mixing control. Well… HERE IT IS ! Expandable to hundreds and hundreds of inputs. Complete control of your DSP via industry standard Waves plug-ins and SoundGrid communication protocols. 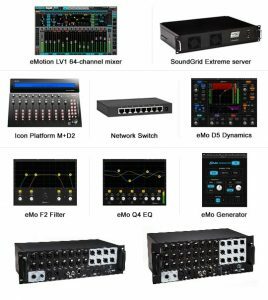 This system can integrate with your existing digital stage boxes and devices – it will even share channels with every major digital mixing console. eMotion LV1 series completely changes the game for professional live or recording mixing and system integration. 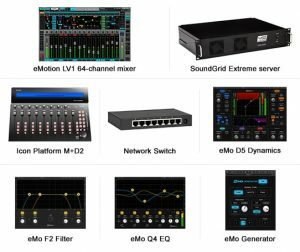 Comprehensive combo for creating the best possible live sound experience for audio engineers and audiences alike: Two SoundGrid stageboxes, eMotion LV1 live mixer with Waves eMo plugins, SoundGrid Extreme Server, 8-port switch and network cables.Deliver top-tier sound quality and enjoy an exceptional workflow with great control using the eMotion LV1 live mixer. Every LV1 channel strip is loaded with plugins optimized for live sound – the super-clean eMo F2 Filter, the diverse eMo D5 Dynamics, and the transparent eMo Q4 Equalizer – so you can start mixing right away.The robust SoundStudio STG2412 and STG1608 SoundGrid stageboxes are the perfect way to interface with the eMotion LV1. Combined, they offer a whopping 40 mic/line inputs with high-end preamps, all of which can be remote-controlled directly from the LV1 mixer channels.All audio coming from the stage to your mixer, through SoundGrid-compatible plugins, is processed on the included SoundGrid Extreme Server. You can then send the processed audio out to the PA system and back to the stage via the 20 line outputs. All this takes place at a phenomenal speed: 0.8 ms at 44.1–96 kHz. Complete with an 8-port SoundGrid switch and four CAT6 Ethernet cables, this combo includes everything you need to set up a SoundGrid-powered live show that sounds amazing (how amazing is up to you).